Rubble, Small, Medium, Large, XL, XXL is available. - This 60 pound box is less than you will find for a 40 pound box elsewhere/online. This Eco-friendly, man-made, bio-active live rock is manufactured in the USA within a closed system using 100% natural ingredients and is calcium based product which is the same natural building block as wild harvested live rock. 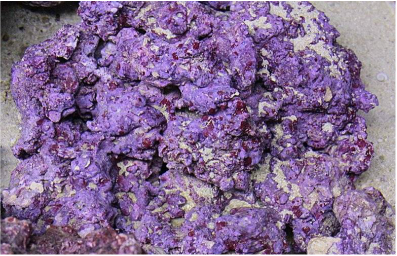 Next, the live rock is injected with a water based non-toxic pigment to produce the beautifully shaded purples, pinks and red colorations. The "Real Reef" live rock is then placed in a freshwater curing process for 12 weeks, followed by a 12 -- 16 week saltwater grow out period in 10,000 gallon climate controlled raceways. More than 13 proprietary manufacturing steps go into producing our "Real Reef" live rock, prior to shipping the rock to the distributors. Live Rock is beneficial for both reef aquariums and fish-only tanks. "Real Reef" live rock will provide a solid foundation for coral in the reef aquarium, and a natural aquascape in a fish-only aquarium. "Real Reef" live rock is easy to maintain in the aquarium, and makes an excellent candidate for the beginner to the expert aquarist. This type of rock requires moderate lighting and moderate water movement, along with the addition of calcium, strontium, iodine, and trace elements to encourage and maintain coralline algae growth.